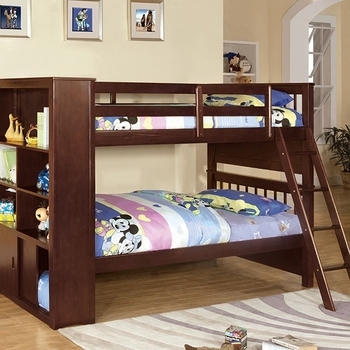 Perfect for any young student, this twin loft bed has a sturdy design with a built-in workstation and handy book shelves. Finished in espresso, the loft bed can be accessed by an angled ladder and provides support for the twin bed. Desk w/ Bookcases 14 Pc. Slats Top & Bottom Angled Ladder Solid Wood, Wood Veneer.